Hold the front page! Stop the presses! 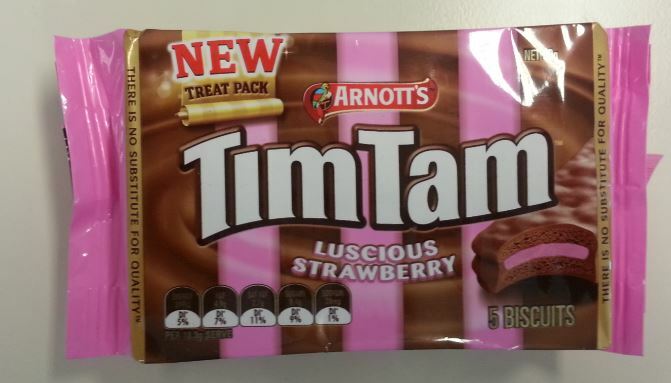 There’s a new Tim Tam in town. At the risk of introducing some bias and prejudice before we even start, I have to confess a strong suspicion about strawberry-flavoured sweetmeats. Whilst I love a fresh strawberry as much as the next person (although possibly not as much as my two year old daughter, who can consume them by the punnet-load before them hurtling around and around the house in a hyperactive frenzy), anything ‘strawberry flavour’ is inevitably a disappointment. (With the possible exception of strawberry jam, which can be quite good with thick cream on scones ). However, I tried to put this thought out of my head an approach these with an open mind. To help counter my bias, I also invited a colleague to sample them with me, and to share his views. 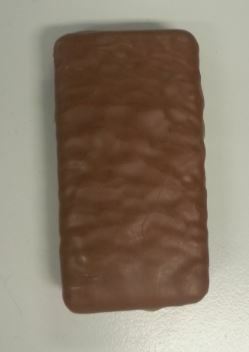 They are constructed like any regular Tim Tam, with a regulation-issue milk chocolate coat and the standard chocolate biscuit. The creme filling, however, is lurid pink – quite startlingly so. As you bring one to your lips, the first thing you note is the strong strawberry aroma. This is actually very promising; it has good strawberry-ish tones and certainly seems a step up from the average. When you first bite into the biscuit, you get quite an overwhelming strawberry taste – the chocolate hardly gets a look in. And it’s not too bad – eyebrows were raised at this point, and my colleague was heard to remark ‘Hmm- actually quite good!’. However, as you continue chewing it starts to pall; it all gets a bit sickly and overdone. When you swallow, you’re left with a strong aftertaste – and one that, unfortunately, has a distinct artificial tang, like a cheap ‘strawberry’ lolly. Notwithstanding the sickly filling (which I guess might be to some people’s taste, rather like the Turkish Delight Tim Tam), this aftertaste is really the only fault. On balance, them, Arnott’s have done pretty well as far as strawberry flavour goes, but being better than a weak competition does not make for a great biscuit. I’m going to give this four out of ten. I came out of work at lunchtime the other day to see two bicycle police officers riding on the pavement outside our building. The ground slopes away a little bit, and one of them instead of being on the pavement proper rode up on the paved area outside the office block. When he got to the end he realised that the pavement had dropped away, and there were a few steps down back to that level – so he just rode down them, clatter clatter. 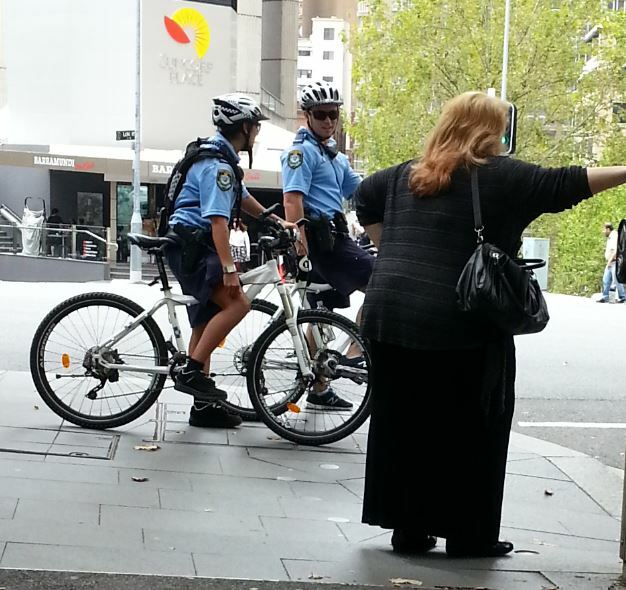 The two officers then continued their leisurely ride along the pavement, through the throng of people on the pavement of the CBD at lunchtime. Now, for sure, they were riding slowly and I’m sure carefully, and not really inconveniencing anyone. And I’m not really averse to careful pavement riding – I do it myself sometimes. But, technically, they were breaking the law – road rule 250, to be precise. I know that the police are able to break the rules in an emergency, or when attending an incident – usually with sirens wailing and so on. But these officers were just meandering along chatting, with no sense of urgency. Now, on the one hand I don’t really mind. After all, I think careful footpath riding should be legal, as it is in for example Japan (where, despite the hectic streets, it all works rather well). 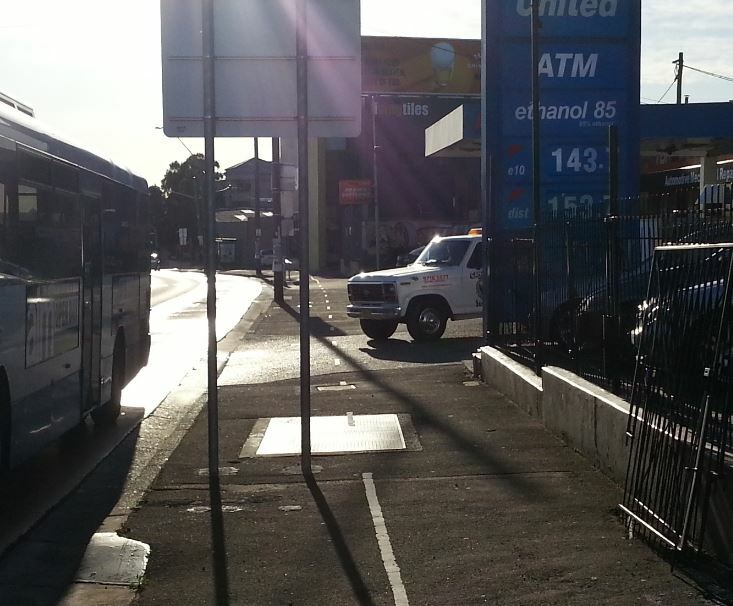 But I can’t help feeling a bit piqued when those same cops pull me up later in the day for flouting rule 256 – one that it seems to me creates less danger and inconvenience to other road users than footpath riding. I didn’t get a ticket – my magic indemnity saw to that – but it was annoying just the same. Various blog-worthy things have occurred to me over recent weeks, but I’ve been too lazy / busy to write them up into proper articles. So here’s a few vignettes for blogs that could have been..
Firstly, what’s the difference between these two photos? 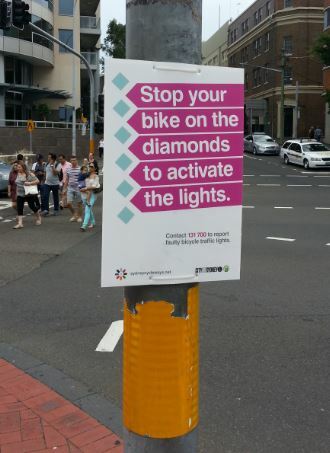 Also on Pyrmont Bridge, I see the City Council have put up new signs explaining how to get the bicycle lights to trigger (if you’re lucky). I note that this time they have included the roads authority complaints line – evidently they (and I) are hoping this triggers a deluge of complaints to the RMS. 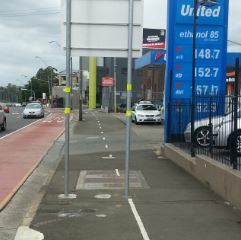 Although I doubt it will, cyclists will simply continue to ignore the lights as they always have. 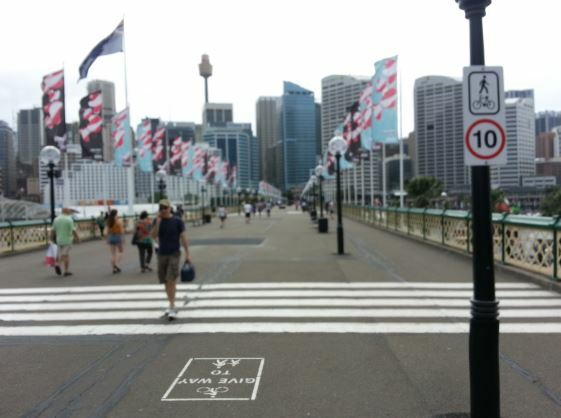 Also on the subject of signs, I felt smug as always heading to the fish market to get the Xmas seafood. 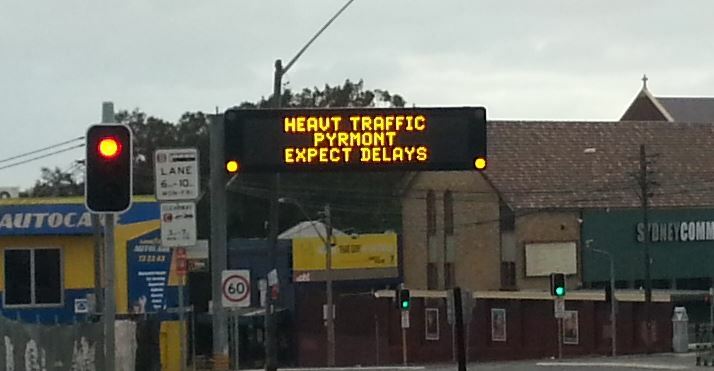 Three or four kilometres away and the signs were warning of delays, and sure enough there were queues if cars everywhere and police directing the traffic. I just cut straight through and rode in, of course. One of the cops on traffic duty was an officer I know quite well due to all my helmet shenanigans, and we exchanged a cheery ‘Merry Christmas!’ as I rode past. Happy New Year everyone – may your 2014 be filled with enjoyable cycling, reading and snacking!